The challenges posed by the rapidly ageing population, and the increased preponderance of disabled people in this group, coupled with the rising level of public expenditure required to service the complex organization of long term care (LTC) delivery are causing increased pressure on LTC systems in Europe. A pan-European survey was carried out to evaluate whether patterns of LTC can be identified across Europe and what are the trends of the countries along them. An ecological study was conducted on the 27 EU Member States plus Norway and Iceland, referring to the period 2003-2007. Several variables related to organizational features, elderly needs and expenditure were drawn from OECD Health Data and the Eurostat Statistics database and combined using Multiple Factor Analysis (MFA). Two global Principal Components were taken into consideration given that their expressed total variance was greater than 60%. They were interpreted according to the higher (more than 0.5) positive or negative correlation coefficients between them and the original variables; thus patterns of LTC were identified. 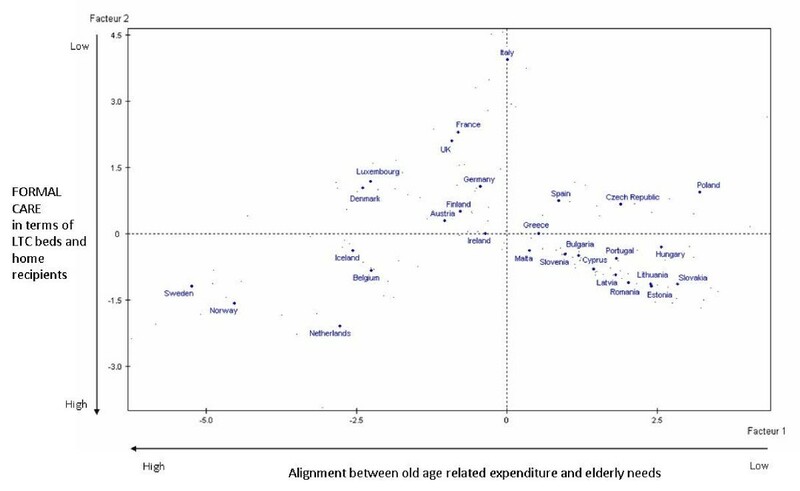 High alignment between old age related expenditure and elderly needs characterizes Nordic and Western European countries, the former also having a higher level of formal care than the latter. Mediterranean as well as Central and South Eastern European countries show lower alignment between old age related expenditure and elderly needs, coupled with a level of provision of formal care that is around or slightly above the average European level. In the dynamic comparison, linear, stable or unclear trends were shown for the studied countries. The analysis carried out is an explorative and descriptive study, which is an attempt to reveal patterns and trends of LTC in Europe, allowing comparisons between countries. It also stimulates further researches with lower aggregated data useful to gain meaningful policy-making evidence. Demographic trends, financial issues and organizational features are the factors that mainly affect current policies of long term care (LTC) in Europe. The OECD defines LTC as "a range of services needed for persons who are dependent on help with basic activities of daily living over an extended period of time". The irreversible process of population ageing is mostly due to the low fertility rate, the increasing life expectancy, both at birth and at age 65, the aging of the baby boom generation (those born soon after the Second World War, who are now progressing towards retirement age), and the uncertain effects of international migration inflows . In 2008, the number of persons aged 65 and over, representing 17% of the total population, surpassed the number of children (aged below 15 years). According to the projections, the number of elderly will almost double in the near future, rising from 85 million in 2008 to 151 million in 2060. The number of the oldest old (aged 80 and over) is projected to increase more rapidly, almost tripling from 22 million in 2008 to 61 million in 2060 . This demographic trend will lead to new patterns of growing morbidity among the elderly. This means an increase in degenerative and chronic diseases, often associated with functional restrictions and disability. This situation is generally related to limitations and dependency on help for one or more of the basic activities of daily living (ADLs), such as eating, washing/bathing, dressing, getting in and out of bed and any other clearly defined self-care activity [1, 3, 4]. Trends for disability are not always clear. In 2007 a study reported non-uniform past trends in disability among some European elderly populations. Denmark, Finland, Italy and the Netherlands showed a falling prevalence of disability, Belgium and Sweden were characterized by a rising trend, while for the United Kingdom and France it was not possible to draw any definitive conclusion because different sources provided diverging results . Additionally, the future prevalence of disability is difficult to predict because it is not clear to what extent the increased longevity will be characterized by additional life years spent in good health (disability-free life expectancy) [4, 5]. However, recent OECD forecasts show an overall upward trend in the share of disabled elderly who will be in need of assistance and will consequently sustain demand for LTC . This will result, inter alia, in a growth of public expenditure on the elderly population. Public expenditure on LTC varies widely across Europe, ranging from 0.2% of GDP in the Czech Republic and Portugal to more than 3% in Sweden and the Netherlands. According to OECD predictions, it is expected to increase by 1.2% of GDP on average between 2005 and 2050 . In such a scenario, characterized by an increasing share of disabled elderly and by rising expenditures, it is crucial for countries to reorganize their delivery systems, finding the balance between formal (more expensive) and informal (less expensive) care [6, 7]. Regarding the expenditure, on the level of formally-provided LTC services a wide variability can be observed across countries. The provision of LTC beds in institutions (other than hospitals) ranges from less than 2% of the population aged 65 and over in Italy to 8% in Sweden, while the percentage of the elderly who are cared for either in institutions or at home ranges from less than 5% in Italy to more than 20% in Norway. In addition, it should be noticed that home care is everywhere much more developed than residential care, thus promoting the concept that the OECD has been calling for some years "ageing in place" . Taking into account the demographic, financial and organizational factors considered so far, a study was carried out with the aim of performing a comparison across the European LTC systems. Our main research questions were: Can patterns of LTC be identified across Europe? What is the dynamic of the countries along these patterns? Short definitions and scientific sources of the variables are provided in Table 1; for a detailed description please see Additional file 1. It includes "health" (HC.3) and "social" (HC.R.6) components of LTC. HC.3 refers to "Services of long term nursing care": it is the medical component of LTC. HC.R.6 refers to " Administration and provision of social services in kind to assist living with diseases and impairment"
Multiple Factor Analysis (MFA) was used to combine the available data . MFA expands Principal Component Analysis (PCA) to the analysis of 3D structured data, where the same variables are measured on the same individuals at various times, forming a matrix X (with dimensions I * J* K) . The variables I in the study were the indicators listed above, the individuals J were the countries and the groups K the five years from 2003 to 2007. Data in the matrix were standardized to overcome large differences in the range and units of the measured variables. First of all, MFA performed separate PCAs on each year's elementary matrix (sub-matrix Xk). Secondly, all the elementary matrices were normalized by dividing all their elements by the root of the first eigenvalue of their respective PCA. All these weighted variables made a general matrix and a global PCA was performed on it. It generated global Principal Components (PCs) or factors that were linear combination of the variables and maximized the variance among data [12–14]. PCs that accounted for at least a total variance of 60% and could be meaningfully interpreted were retained to explain enough variance with as few meaningful factors as possible [15, 16]. They were interpreted according to the higher (>0.50) positive or negative correlation coefficient between them and the variables . The global PCA finally constructed a factorial space, in which the global PCs were represented by axes and each country by five partial positions (one for each year) as well as by a gravity centre, representing the average spatial pattern for the country . Combining the interpretation of the axes, four main patterns of LTC were identified. With respect to these patterns, a static comparison between EU countries was carried out considering their gravity centre points. It was possible to make a dynamic comparison according to the trajectories of the countries defined on the factorial space, the trajectories being characterized by the shape and length of the arrows connecting the partial representations for each country. Linear arrows were interpreted as clear dynamic along the axes, circular lines as overall stable movement, and broken and irregular arrows were interpreted as unclear trends . The French SPAD Package Software 5.0 was used to perform the analysis. MFA generated five PCs. Two factors were retained which explained a total variance of 59.28%. (Table 2). The PCs were interpreted according to the correlation coefficients represented in the correlation circle (Figure 1). The first factor was always highly and negatively correlated with variables expressing the total LTC expenditure, the social protection benefits for old age and the share of population aged 80 and over. From 2005 onwards, it also had a significant positive correlation with the self-perceived activity restrictions and the self-perceived health status as bad or very bad. This factor was therefore described as the alignment between old age related expenditure and elderly needs. The second PC was mainly negatively determined by the variables of LTC beds in institutions and recipients at home. It was therefore defined the factor of formal care, in terms of LTC beds in institutions and home recipients. Correlation circle of the variables on the two Principal Components (Factor 1 and Factor 2). Beds: beds in institutions; R. inst: recipients in institutions; R. home: recipients at home; Over 80: share of people aged 80 and over; Bad perc. health: self-perception of health as bad or very bad; Act. restr: self-perceived restrictions on activities; LTC Exp. : LTC total expenditure; Soc. benef. : social protection benefits for old age. Numbers represent the corresponding year for each variable. Figure 2 represents the MFA factorial space. Comparing the average points of the countries, the first axis opposes Sweden, Norway and the Netherlands to Poland, Hungary and Slovakia, while there is an evident contraposition between Sweden, Norway and the Netherlands and Italy, the United Kingdom and France along the second axis. Combining the information expressed through these two factors, four main patterns of LTC appear, each of them being associated with some countries. Starting from the bottom left quadrant, there is a first group of countries - Nordic countries in particular (Sweden, Norway, the Netherlands, Iceland, Belgium) - especially characterized by high alignment between old age related expenditure and elderly needs, coupled with high formal care in terms of LTC beds and people cared for at home. In the top left quadrant there are countries characterized by high levels of both LTC and social benefits expenditures serving the elderly population, good health status and less restrictions on activities as self-perceived by the elderly, and a high share of population aged 80 and over (especially Luxembourg and Denmark). These countries also have a low level of formal care (especially Italy, France and the United Kingdom). In the top right part of the graph, Spain, the Czech Republic and Poland show a pattern of LTC characterized by lower LTC and social benefits expenditure, worse health status as self-perceived by the elderly, and a low level of formal care. Finally, in the bottom right quadrant, in countries as Slovakia, Hungary, Greece and others, the majority of south-eastern Europe, there is low alignment between old age related expenditure and elderly needs, though formal care is slightly above the mean. 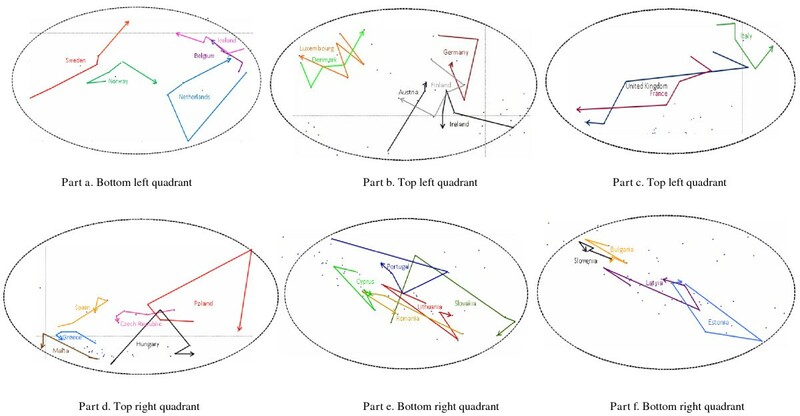 Regarding the dynamic comparison (Figure 3), the arrows of Sweden, Iceland and Belgium in the bottom left quadrant, as well as those of Denmark and Austria in the top left quadrant, indicate a linear and clear dynamic. Sweden moves towards the top left quadrant, i.e., towards a reduction in the amount of formal care provided through beds and home care. Denmark and Austria follow a similar trend, while Iceland and Belgium show a slight reduction of formal care, but an increase in the alignment between public LTC and social benefits expenditure and elderly needs. Countries like Norway, the Netherlands, Germany and Finland have an overall stable dynamic along the axes. Ireland and Luxembourg have broken lines which denote unclear trends (Figure 3, part a and part b). The dynamic of the United Kingdom and France, still in the top left quadrant, is clearly towards an increase of the level of LTC and social benefits expenditure, of better self-perceived health and less self-perceived restrictions on activities and of increased level of formal care. Italy has a trend of reduction along the first factor, and an unclear trend along the second one (Figure 3, part c). The top right quadrant is characterized by the clear trend of the Czech Republic towards the negative semi axes of the first factor, by the circular movements of Poland and Hungary, and by unclear dynamic of the resting countries (Figure 3, part d). The bottom right quadrant is characterized by closed or irregular broken lines (e.g. Portugal, Lithuania, Estonia, Latvia), which denote either stable or irregular and unclear dynamics (Figure 3, part e and part f). Dynamic trends of the 29 European countries. Detailed view of the four quadrants of the MFA factorial space. The main findings in this study are the different patterns of LTC that were identified. Countries characterized by closer alignment between old age related expenditure and elderly needs are those where the needs of the very old population seem to be properly met by the level of expenditure in the LTC sector and on social benefits. This pattern characterizes both Nordic and Western European countries. The majority of Nordic countries having higher levels of formal care are supply oriented systems, with a strong state responsibility for providing formal care . This model of welfare also includes Denmark, where a varied range of adapted dwellings for older people have been developed in the last decades . payments to informal caregivers as income support . Also in some Nordic systems, cash for care schemes have been introduced to reform policies that were seen as too supply oriented, costly and unresponsive. This is the case of the Personal Budget for Care and Nursing in the Netherlands, the Care Wage in Norway, and the Attendance Allowances and the Care Leave in Sweden. These programs were all introduced to bring some flexibility into the LTC system. In Sweden, the employment of payments for care interventions, coupled with a reform policy that restricted care services to highly dependent elderly with limited family support, lowered the proportion of older people who received home care. This might explain the linear dynamic trend that emerged in the analysis [1, 22]. The dynamic of both France and the United Kingdom is towards increasing resources addressed to the elderly and a surging amount of formal care. Since the mid 1990s France has undergone a process of reforming LTC, aiming to increase the number of recipients on the basis of a universal principle, and growing attention has been paid to elderly care after creating the "Plan for frail elderly people" in 2004 . The United Kingdom has also faced some reforms of the LTC system in recent years, increasing the proportion of older dependent people who receive intensive home care packages . Mediterranean and Central-South Eastern countries show less alignment between old age related expenditure and elderly needs. In addition, Mediterranean countries are especially characterized by lower levels of formal care, which is explained by the large amount of informal care which is mostly privately paid. In these countries, the source of welfare is traditionally the family, which provides the bulk of LTC, due to the way individuals perceive their responsibilities and the lack of other care options. In Greece, for example, relatives feel a duty to care which is reinforced by legal duty, social attitudes and lack of alternative care [24, 25]. Other factors, such as the proportion of elderly people living alone, influence the availability of family care and the willingness of family members to provide it . In terms of living arrangements, the proportion of old people living alone varies across Europe, with the lowest number still seen in some Southern European countries (19%) compared with 34%, 32% and 24% in the Nordic countries, Western and Eastern European nations respectively . In Spain LTC was not defined as a specific service within health and social policy until recently . Although several regions have begun specific programmes of building or subsidizing new facilities, there is a shortage of institutional care in many areas, and the majority of elderly people who receive care at home pay for private home help or rely on informal care . The indistinct pattern of Italy and its irregular dynamic reflect the high variability and fragmented policy within the LTC system. This is due to two factors: the growing responsibility of regional governments in health care organization and funding, and demographic and cultural reasons. The supply of beds in LTC institutions as well as the employment of cash for care programmes, for example, differs substantially across Italian regions [23, 28, 29]. The linear dynamic of the Czech Republic is to a certain extent explained by a recent reform that laid new foundations for the provision and funding of social services and emphasized cash allowances paid to those in need of care. This marked a major turning point in the Czech LTC system, even though it remains to be seen what further developments the implementation of the new system will produce . Central and South Eastern countries, despite the predominant role of informal care, show a level in the provision of formal care which is slightly above the average European level. Although the existing LTC infrastructure is very limited and poor, there is a lack of investment in new projects, and talks about privatization have not been supported by an adequate regulatory framework and financial support, these countries are service-oriented in the sense that residential care is the only alternative to informal arrangements and family networks . In Hungary, social services for the elderly and the disabled do have a relatively well developed institutional network, however, they do not meet growing needs either in terms of number of places or quality of the services . The unclear or irregular dynamics of these countries might be explained by the major transformations of their welfare systems in the past two decades, the majority oriented toward social insurance schemes. In Slovenia, for example, intensive debate resulted in a proposal for a LTC insurance scheme, but this scheme has yet to be implemented . The scenario which arises from our analysis confirms the distinction between "weak family"/"individual" and "strong family" countries, which opposes the Northern and Western countries to Mediterranean and Southern ones. The latter ones are, in fact, characterized by traditional family structures, lower divorce rate, very late and increasing ages of leaving the parental home, most frequency of contact between parents and children . These differences might result from religion traditions and cultural values, reflecting the European Protestant-Catholic dichotomy (Protestant emphasis on individualism versus Catholic family values) and the different social role attributed to men and women (high Femininity index in Nordic countries versus predominant Masculinity dimension of Latin ones) . Our analysis has some limitations. First of all, the quality of the analysis is only as good as the quality and comparability of the international data allowed. For instance, data deriving from OECD are collected from national sources which vary from one country to another, so that variables such as Beds in institutions or Recipients in institutions may include different type of nursing homes or facilities. Also the variables expressing self-perceived health are influenced by subjectivity and international cultural differences, that could be the same that influence the self-reported level of "happiness", which is demonstrated to be higher in Nordic countries rather than in Southern ones . Another limitation of the study is that some variables (i.e. the two related with the self- perceived health status and self-perceived activities limitation) were available only from 2004 onwards. A relevant shortcoming of the MFA is that it fails to process missing elements, so that some relevant variables were excluded from the analysis . In fact, international sources do not report systematic or complete data regarding, inter alia, the formal and informal workforce employed in the LTC sector and the share of elderly people living alone. Still regarding the statistical method, different rules exist to retain factors that can lead to different results. However the explained variance criteria with a cut-off point of 60% was chosen in order to explain enough variance with as few meaningful factors as possible [34, 35]. In addition, the interpretation of the factors generated in the MFA was "heuristic", meaning it was plausible and convenient even if not the only one possible; more than one interpretation can be made of the same data factored in the same way. Finally, the MFA does not identify causality. The strengths of the study are many, however. It was an exploratory and dynamic analysis, that allowed us to take into consideration and to combine several important variables related to the LTC, thus having a global and integrated picture of them, allowing the confrontation of whole information, which is more rich than an examination parameter by parameter . In addition, MFA has very good visualization properties, which makes it a suitable technique for data exploration . Finally it was possible to perform the analysis despite the lack of two variables for the first year . This study may represent a useful contribution to the resources for decision makers when dealing with the future common challenges that, apart from specific contexts and issues, all EU countries have to face. Building adequate systems of LTC is one of the most important challenges, which involves the integration and coordination of care between different service providers and between health and social care. The main critical issues are the organization of the LTC system and the balance between formal and informal care, residential care, home care and cash allowance programmes, and provision by the public and private sectors . In the future, the availability of informal carers and their willingness to provide care will diminish, due to changes in family structure, growing participation of women in the labour market, and ageing of the partners and children who would otherwise supply informal care . Given the general preference of elderly people to remain in their home for as long as possible with assistance, especially from their family, such informal care should be adequately supported by information, training, counseling, financial aid, employment leave and formalization of the role within the social security system . Another relevant challenge will be the shortage of workers in this labour-intensive sector which requires adequate and well trained staff. Thus, policies aimed to improve the recruitment and the retention of qualified LTC staff and their working and contractual conditions will be needed . Other critical points will be access to care and its quality, along with the fiscal sustainability, in terms of resources and expenditures allocated to the LTC sector and to the social protection systems . It is recommended that countries should give priority to single entry point processes to manage LTC, in order to guarantee integrated and continuous care . Finally, lack of international standard definitions, such as for disability and LTC expenditure, the use of different methodologies to gather data on the prevalence of old age disability and to measure the incidence of chronic conditions, some unclear demarcations (such as between the health care and social services sector, and between acute care and rehabilitation), and blurred boundaries between public and private sector provision, lead to the need for a more comparable, complete and up to date international database [7, 30]. 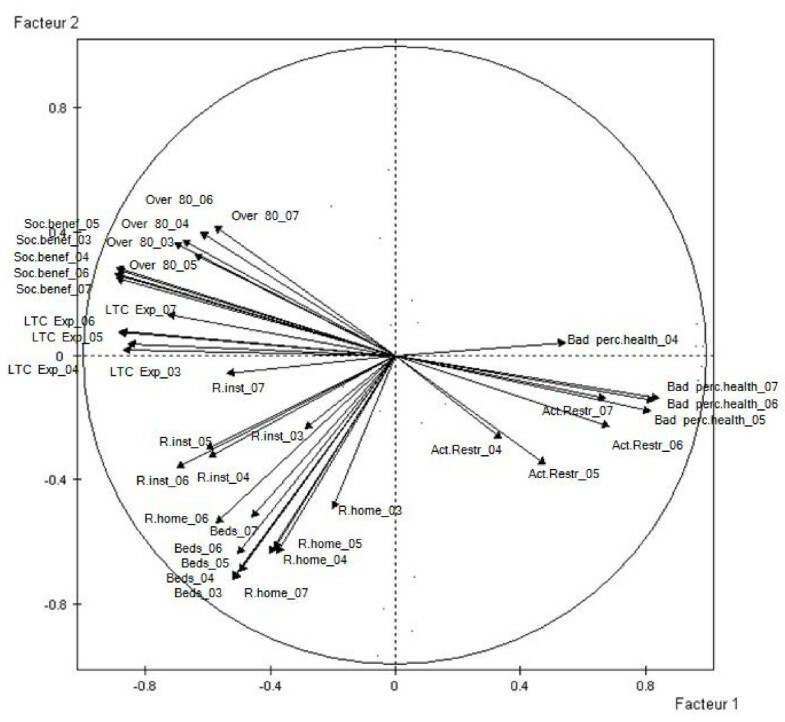 In this study the issue of the LTC in Europe was analysed through the methodology of Multiple Factor Analysis, which is a feasible, rigorous and reproducible method that made it possible to combine several variables drawn from international databases. The application of this technique allowed us to take into consideration aspects concerning organizational settings, elderly needs and public LTC and social benefits expenditures over a number of years. The analysis carried out, which is based on cross-sectional/time series and aggregated data, is an explorative and descriptive study. It represents an attempt to quantitatively reveal patterns and trends of LTC, allowing comparisons between the 29 European countries. The relevant findings of the study are also a source of inspiration to stimulate further researches with lower aggregated data and in non-ecological design, that could overcome the limitations of this study and might reveal mechanisms behind these results useful to gain meaningful policy-making evidence. The authors would like to thank Bruno Federico who critically reviewed the statistical analysis of the study. GD, and WR contributed to the conception of this paper. GD, LS, AA and VF conceived the study, AS, and AB provided data sources and participated in its design. GD and VF drafted the manuscript. LS, AA and DFI conceived the statistical methodology; LS, AA and VF provided the acquisition of data and performed statistical analyses. GD and AA had full access to all of the data in the study and take responsibility for the integrity of the data and the accuracy of the data analysis.